On 8 July, 2015, the European Parliament finally adopted a resolution on the Transatlantic Trade and Investment Partnership (TTIP). The TTIP resolution contains non-binding recommendations to the Commission regarding digital rights, among other topics. At the beginning of 2015, EDRi published its red lines, which was later developed into a booklet “TTIP and Digital Rights”. On 8 July 2015, the Parliament did not fully listen to the concerns raised by many citizens. There are positive aspects to highlight, but the European Parliament’s Resolution breached some of EDRi’s red lines. The Parliament acknowledges that the lack of transparency has “led to deficiencies in terms of democratic control” on the TTIP negotiations. However, the Parliament rejected amendments to increase the transparency needed in the TTIP negotiations – to the detriment of democracy. We fully support the European Ombudsman’s decision of 6 January 2015 and her recent who request for more transparency, especially from the US side. 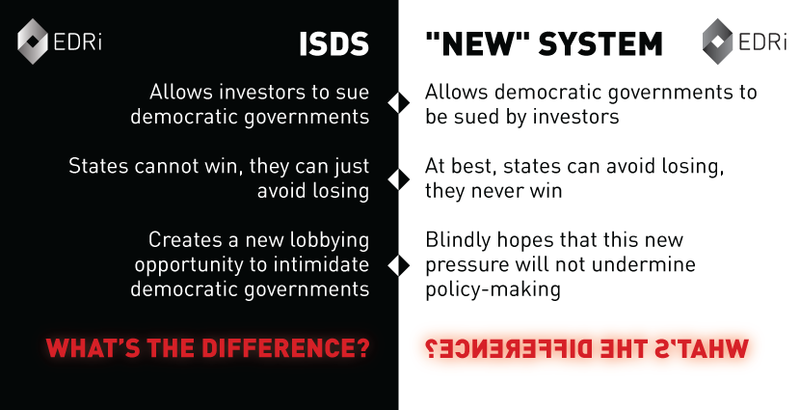 Unfortunately, the Parliament voted to change ISDS for a “new” system, which could still repeat the flaws of ISDS. Whereas both the Civil liberties and the Legal Affairs Parliamentary Committees recognised the importance of the rule of law in their respective opinions, the Resolution does not even mention the rule of law. The Parliament recommended that the Commission protect the EU’s right to regulate, but the recommendations regarding the so-called “regulatory cooperation” still raise concerns regarding the chilling effects it may cause to the EU’s legal and political framework. We welcome the Parliament’s call for the Commission to include a “legally binding and suspensive human rights clause”. We regret that the Parliament did not want to clarify what this means, as it rejected Amendment 80, which fully represented EDRi’s red line on human rights clauses. The European Parliament failed to follow the strong opinion of the Legal Affairs committee to exclude copyright, trademarks and patents from the negotiations. We welcome the European Parliament’s call to include a horizontal self-standing clause in TTIP to exclude the current and future EU Data protection legislation from being traded in TTIP. However, the Parliament failed to ask the Commission to refrain from negotiating on the flow of personal data in trade agreements, as the Parliament’s Civil Liberties Committee had requested. We welcome that Parliament reiterated that its consent to TTIP could be endangered if US mass surveillance programmes are not “completely abandoned”. Additionally, the European Parliament had the possibility to recommend the Commission to exclude “encryption standards, or the certification thereof, in the TTIP agreement, since there is no economic benefit to be derived, but rather a serious potential economic and societal loss”, but that amendment was rejected. The European Parliament avoids mentioning net neutrality in TTIP’s resolution, which seems reasonable for EDRi. In sum, this resolution did not suffer many changes as compared to the report adopted in the International Trade Committee (INTA). TTIP’s resolution is just a political indication for the Commission and the world. Ultimately, the European Parliament will say yes or no to the TTIP once negotiations are concluded. In the meantime, it is important not to lose track of the negotiations and the conclusion of other agreements, such as CETA (the Comprehensive Economic and Trade Agreement between Canada and the EU) or TiSA (the Trade and Services Agreement).